The Lloyd's building in the City of London, constructed using concrete, glass and stainless-steel, houses one of the world's most famous financial institutions — a world-wide marketplace for the insurance industry. Designed by Richard Rogers Partnership, the building was engineered by Peter Rice at Ove Arup & Partners, who viewed it as an exploration of the properties and uses of concrete. From the outside, the building is a little deceptive. Its rectilinear plan form and structural grid is largely hidden by a series of service towers and external lift arrangements, which make the building look more like an assemblage of different elements. The site is defined by the Medieval layout of the surrounding streets, adding to the overall effect. The plan of the building is a rectangular doughnut, 68.4m by 46.8m overall, with 16.2m span floor plates. In the middle is a spectalar full-height atrium, 12 stories high with escalators criss-crossing the void. The main structural elements consist of 28 in situ concrete columns, just over a metre in diameter, set on a grid of 10.8m centres — 20 along the façades and eight in the atrium. These support the floor plates on a 16.2 x 10.8m grid with 5.4m cantilevered corners. The floor plates are formed from a 1.8m square grid of in situ concrete beams, the first layer of the floor system. The beams have short concrete column stubs at the grid intersections that in turn support a thin concrete flat slab. The zone between the beams and the slab is used for services. For speed and ease of construction, the slabs were cast using a permanent formwork of steel plates, from which building services installations were later suspended. The beams connecting the columns were increased in strength by connecting two parallel pre-stressed beams to form an inverted U beam. The pre-stressing enabled the beams to be shallower than normally reinforced beams. Pre-stressing was used at other points too where loads or spans were excessive, with the purpose of maintaining the overall uniform visual appearance intended. The third notable element of the concrete frame is the set of precast brackets for the columns, which extend into the building to support the floor plates. Each was cast as a hollow cylinder with a projecting 'ledge'. A bracket was placed on the head of an ready-cast column and concrete poured into the cylinder, neatly joining column and bracket. The weight of the floor plates and live loads sent through the brackets is met by the strength of reinforcement in the brackets and columns, and counteracted by the weight of the structure itself. The brackets on the exterior columns also connect the building's main bracing to the column grid. The bracing is made of concrete-cased steel tubes, a composite that allows for relatively small diameter members. In his book An Architect Imagines, Peter Rice describes that the structural solution for the Lloyds building occurred to him one evening in Turin while he was working on the Fiat car project he undertook with architect Renzo Piano. The design of the grid and how the columns and floor grid would work together all came at once, the result of weeks of earlier discussion of the issues no doubt. The building's main services are housed in six structurally-independent precast concrete service towers that range around the building. Three are principally for fire fighting and escape stairs, three for lifts, risers and lavatories. Plant rooms are located on top of four towers, expressed as giant steel boxes. All the towers are capped by blue-painted service cranes used for maintenance and any necessary replacement of building parts. Most of the external modules are clad in stainless steel — one of the identifying features of the building. The exterior walls are triple-glazed, provideing floor-to-ceiling air ducts at each level. The office floors surround the atrium and are planned in modular layouts for flexibility of use. Offices are partly lit from the atrium and partly from lighting units that also act as air extractors. The 'inside out' approach to the design of the building has its roots in the generation of architects that emerged from the Architectural Association in London in the 1960s. Archigram, a pop-culture movement involving AA students and tutors, dreamt of 'instant cities' made up of plug-in buildings using prefabricated modules. The service modules, rooftop cranes and open cellular gridlike structure of the Lloyds building echo the imagery of Archigram. It's interesting that Lloyd's commissioned such an avante garde building. The design was received with some hostility when it opened. Perhaps it was a brave move to take the concept and industrialised look to the City of London. Yet it's still a multi-storey building in a high-density location and the engineers had to solve the usual problems that go with this: designing for long life, and dealing with an exacting brief and planning issues. 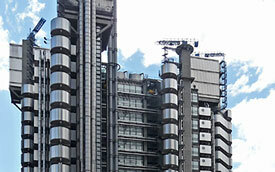 The Lloyd's building at first glance appears to be composed of a loose-fit, adjustable kit of parts. In reality, it was designed and built to exacting engineering standards with little likelihood that any plug-in aspects would be explored. However, it stands as one of the few examples of what is now seen as an exciting design movement centred on 1960s London. In 2011, the Lloyd's building was granted Grade I listed status. "Architecture in the Twentieth Century"